St Sampson Cathedral is located at the Vyborg Side. It is one of the first cathedrals in St Petersburg. The archi­tectural style of this cathedral is a combination of old Rus­sian traditions. The cathedral was designed by the un­known master. Near the place where St Sampson Cathedral stands now, in 1715 the wooden church was laid by Peter I. The design of that church was created by the famous archi­tect Domenico Trezzini. The construction of the church lasted from 1715 till 1718. The church was founded by Peter I in the memory of the Poltava victory over the Swedish army on the 27th of June 1709 on the day of St Sampson. Very soon the church started to destroy because of bad weather. It was demolished. In 1728 the construction of the new cathedral was started. At first the stone chapel was built. The construction of the cathedral was prolonged. Only in 1740 the main altar was sanctified. At first the cathe­dral had only one dome. The cathedral was crowned with an onion-shaped cupola. In 1761 four minor drums with cupolas were added. The building received a traditional five-dome completion. 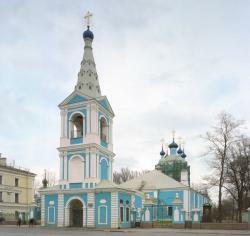 The cathedral was erected in the style which is traditional for Russian church architecture. The iconostasis of the cathedral was created between 1737 and 1739. The five-tiered wooden iconostasis be­came the main decoration of the cathedral. It was made in the style of baroque by the Russian masters of the 18th century. The iconostasis was decorated with columns and flower garlands. They were painted by the artists Bashnin, Pospelov, Bazhenov and others. Most icons were executed between 1720 and 1760. In the middle of the cathedral there was an ancient icon of the Mother of God. On the right side there was an icon of St Sampson. Near the cathedral there were two cemeteries. Several times Peter I visited these cemeteries. Some of his comrades-in-arms were buried there. In these cemeteries some outstanding people were buried: architects Domenico Trezzini, Jean Leblond, Andrias Sheltter, George Mattarnovi, Nicholas Gerbel, the sculptor Carlo Rastrelli and others. There is a bronze memorial on the grave of the ex­ecuted participants of the conspiracy. They took part in the conspiracy against Ernest Iohann Biron. The states­man Biron was the favourite of the Empress Anna Ioan­novna and creator of the reactionary regime the “Bironovshina”. Artemy Volynsky, Pyotr Yeropkin and Andrey Khruschyov were buried there. The design of this memorial was created by Mikhail Schurupov. The famous sculptor Alexander Opekushin took part in the creating of this monument. It was installed in 1885. These cemeteries were closed at the end of the 18th century. After the revolution the gravestones were de­stroyed. St Sampson Cathedral was closed in July 1938. At the end of the 20th century the cathedral was restored and returned to the believers. Now the services are held in the cathedral.